Once upon a time a stage set consisted of painted flat surfaces which could be raised and lowered easily for set changes. I know at Santa Fe they don't have a space above the stage where the set pieces would usually go, so they slide them on and off at the sides like a deck of cards. This is smooth and easy, and does not require an army of stage hands. Who wouldn't fit on the stage at Santa Fe anyway. There's also a big elevator at the back. Larger companies like the Met, the ROH and the Bayerische Staatsoper look down their noses at painted flats. They will occasionally use sets where the objects stay the same but are made to seem varied and interesting through the use of projections. Lately the projections have started to become movies. The current rage throughout the opera world is for a whole opera to be presented in a single set. 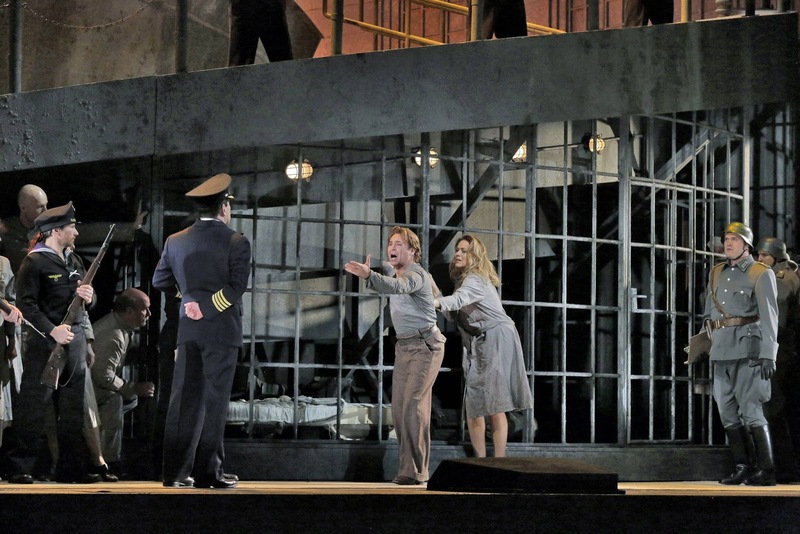 A set made up of two rows of boxes where the various scenes move from box to box was seen in Peter Grimes from the Met in 2008. 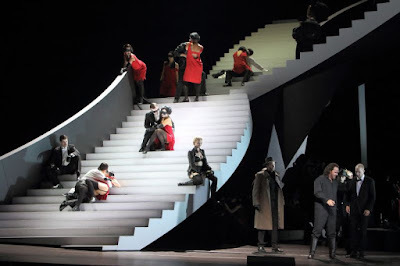 Another similar production was seen in Don Giovanni also from the Met. This achieves the goal of a single set but makes each scene small and unimpressive. It looks great in the movie theater but cramped in the house. Cav/Pag from the Salzburg Easter Festival both was and wasn't done as two rows of boxes. The bits of stage were framed into boxes, but on the stage things seemed to change and often extend across two or more boxes. It was both confusing and interesting. The way this was done seemed legitimately creative, and not just a cop out. The single set as a giant staircase is another common theme. 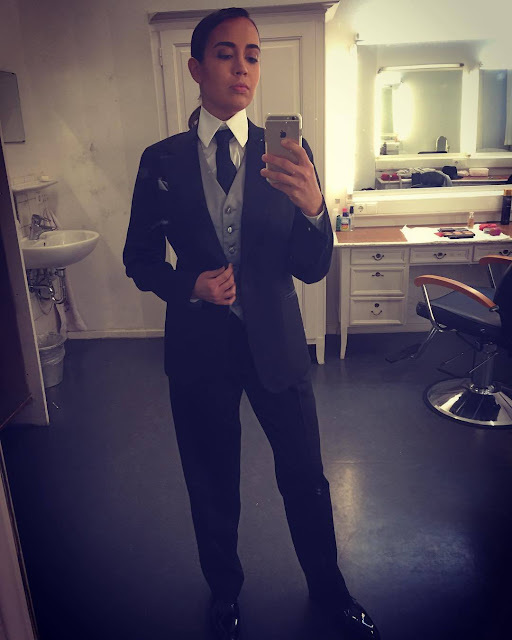 We saw this in Arabella from the Bayerische Staatsoper and again in Un Ballo in Maschera from the same company. Ballo was far more confusing than Arabella. The visual unity did not match the story of the masked ball. The libretto says we are in a palace, a cave, a deserted field, and finally back to a palace again. A giant staircase doesn't communicate this at all. It communicated that perhaps the prince was hallucinating. 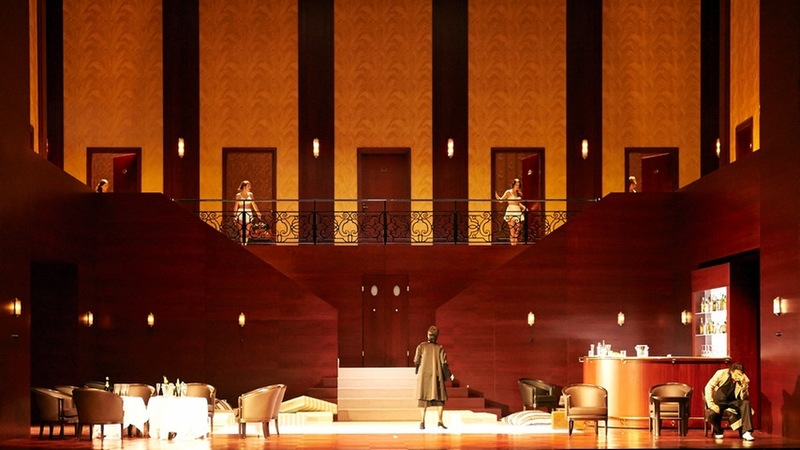 My favorite of all the single set productions has been Don Giovanni in a hotel lobby from Salzburg, seen at top. 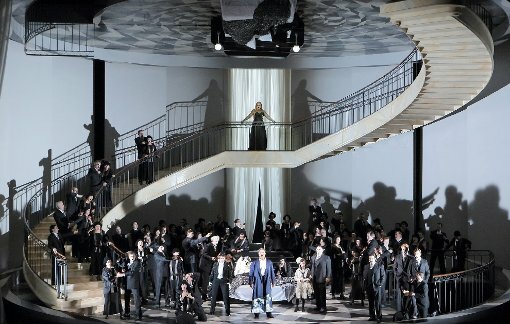 Usually the sets for this opera are difficult to follow because each small scene is supposed to represent a different location. The hotel lobby staging was genius. All these things might well happen in a hotel, where weddings are celebrated, meetings are held, tourists arrive and leave, bedrooms for dalliance are easily found, strangers encounter one another, etc. We want more than just money saving single set productions. We still want the production to explain the action, to intensify the emotions through thoughtful design. And yes, I know this is a difficult task. I'm starting to feel that all too often the production designer simply doesn't want to spend time discovering the opera and skips to a simple solution. I'll have to put him in my sexiest list. The Bayerische Staatsoper brought us Verdi's Un Ballo in Maschera in a manner we might have expected. The whole thing takes place in Riccardo's bedroom. This must surely indicate that it's all a dream. The It's all a Dream staging is certainly one of the more annoying. My most recent one of these was Falstaff from Florence. Interestingly, that was also conducted by Mehta. Everything is in black and white, and the stage is a bit dark for a stream. I watched this out of order, middle first, followed by beginning, so I noticed that the woman with long blond hair that appears mysteriously at the beginning is Ulrica the witch. Throughout this opera a lot is going on. The male chorus is divided into two groups: those friendly to Riccardo and those who are conspiring to kill him. For the first time in my experience they are both labeled and translated in the subtitles. If you watched without text, you wouldn't guess this. I didn't realize before this that Riccardo so dominates the action. No excuse. He appears in various guises: as himself, as a dead body uncovered by Ulrica lying on his own bed, and as a ventriloquist dummy, sometimes operated by Oscar and sometimes by Riccardo himself. Piotr sings, dummy's mouth moves. If this means something, I didn't guess it. I thought ventriloquists were completely out of style. I'm surprised by what a wonderful role this is for Piotr. Now we wake up in Renato's bedroom where he is in bed with Amelia. Ulrica is here, too. We're supposed to be in a field with a gallows. Anja sings her aria. I didn't realize Oscar actually has a bigger part. Riccardo appears, which is fine if we're in a field but iffy when we're in Renato's bedroom. He sleeps through the whole thing. Renato wakes up during the love duet. The lovers spot him, and Amelia gets back in bed and covers up. This is rather spectacularly silly, but the plot is actually more plausible if Renato is a lot more boring than Dmitri. I have loved the music. Harteros may be by now my favorite current Verdi singer, though this is not the best role for her. Ulrica is still with us at the end. Around the internet today are people who are remembering the tenth anniversary of the death of Lorraine Hunt Lieberson. The actual date isn't until July 3. The anniversary today is for her last performance. Here is something I haven't heard before. She was a transcendent performer who cannot be forgotten. This picture appeared on women's day. Row 1: Renee Fleming, Montserrat Caballé, Aïnhoa Arteta, Natalie Dessay, Anna Netrebko. Row 1.5 (short): Leontyne Price, Lina Cavalieri, Kiri te Kanawa, Angela Gheorghiu. 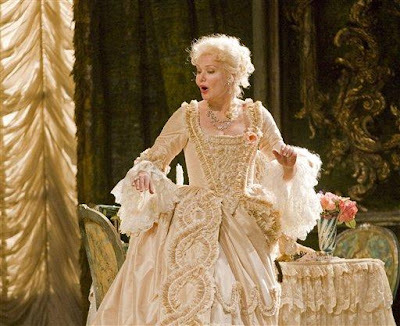 Row 2: Angela Gheorghiu (again), might be Nellie Melba? 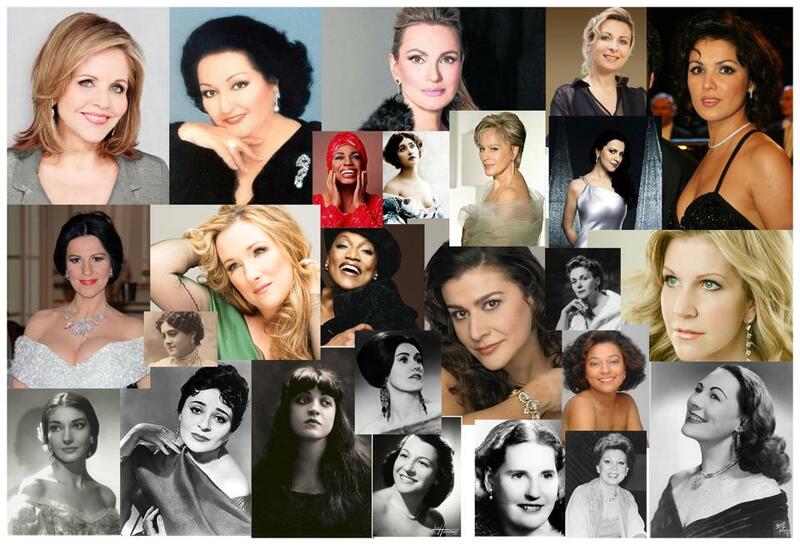 (small), Diana Damrau, Jessye Norman, Joan Sutherland (small), Cecilia Bartoli, Elisabeth Schwarzkopf, Kathleen Battle, Joyce DiDonato. Row 3: Maria Callas, Victoria de los Angeles, Rosa Ponselle, might be Elly Ameling?, Kirstin Flagstad, Mirella Freni, Renata Tebaldi. They are all there. All the phases of my operatic heroines are represented, including Elisabeth, Leontyne, Kirsten, Victoria, Kathleen, Jessye, Cecilia, Anna, Natalie. Perhaps Christa and Tatiana are missing, but then Cecilia and Joyce are the only mezzos. Disappointed in concert last Saturday, I thought I would point out how this is supposed to sound. I missed the live simulcast of Puccini's Manon Lescaut from the Metropolitan Opera but saw the repeat last night. Our old movie theater is gone, and we are required to drive a much longer distance. But if I apply my usual criterion, I must say that for explaining the action, you could not beat this. Every line of dialog in the complex second act was enacted vividly, clearly and understandably. The bombed out church is a "wasteland" idea is iffy, I admit, but the action in that act is not complex. She complains that she is lost and abandoned, and she dies. The actors complained about all the stairs. It is somewhat shocking that Roberto Alagna has never sung this opera before. He could not be more perfect. He projected youthfulness incredibly well and sang up a storm. Both vocally and dramatically Kristine is more in tune with Jonas, but I must say I loved Alagna and Opolais together. This pairing will repeat for Madama Butterfly. The Met will be sorry to lose Fabio Luisi. The one and only Ewa Podleś sings Prokofiev's Alexander Nevsky. Renée Fleming gave a recital last night at Zellerbach in Berkeley with pianist Olga Kern. I am having a hard time deciding what to say. Unfortunately, Renée has reached the point in life where her voice is not the gorgeous instrument it has always been. Before today I have always been pleased to report that she sounded great. It was pouring rain, and the concert started very late, so perhaps this contributed. A piano piece was inserted so she could exit the stage. Perhaps it was just for today. Renée is a celebrity who can charm any audience into submission, even me. Sigh. Strauss was best. Of course. We were asked to sing "I could have danced all night." Nikolaus Harnoncourt has died. He was one of the founding members of the Gramophone Hall of Fame. He co-founded the Concentus Musicus Wien 1953 and went on to conduct at the Salzburg Festival. He was descended from European royalty. He wasn't always loved. On my copy of Le Nozze di Figaro from Salzburg I note that he was heavily booed. 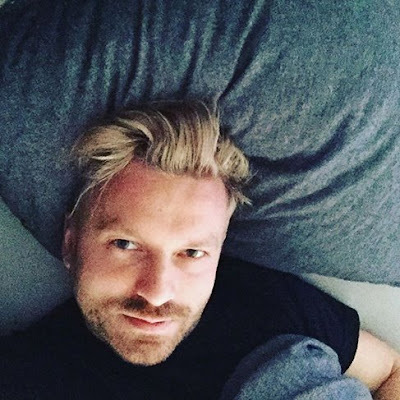 Since I followed her way before he did, I'm not willing to credit him with discovering Anna Netrebko. I think that goes to Gergiev. He worked on many occasions with Cecilia Bartoli, including a two disk concert with Concentus Musicus Wien. They did primarily Mozart and Haydn together. I have enjoyed his work in Bach, Beethoven, Mozart, Monteverdi, Weber, etc. We will miss this great maestro. At the Grammys the opening scene of the Broadway show Hamilton was presented in a stream from the theater where it plays. My take on this was that it was like an early all recitative opera, Peri or Caccini, with a back beat. It was easier to understand than rap usually is. Who knows if I would like rap if I ever knew what they were saying.